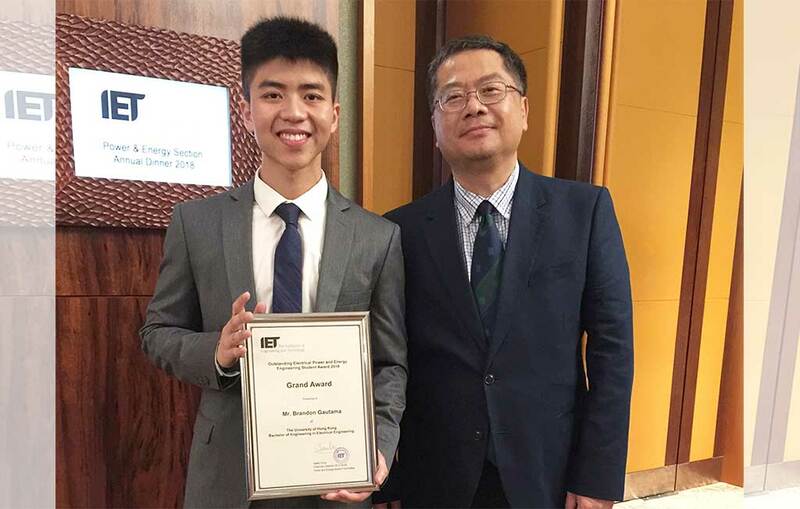 Mr. GAUTAMA Brandon, our BEng(EE) Year 4 student, is honored the “Grand Award” of the Outstanding Electrical Power and Energy Engineering Student Award 2018, The IET Hong Kong. He attended the prize presentation ceremony at the annual dinner of IET Power and Energy Section on 22/6/2018 Friday, in the Hyatt Regency Hotel. Apart from outstanding academic results, the awardee is also selected based on his strong leadership ability demonstrated in his extra-curricular activities and community service. The awardee has received a certificate, cash prize and one-year free membership in IETHK. Congratulations!